I'm sorry for the delay in posts. We went out of town for a week and I accidentally forgot my memory card reader, so couldn't update as I would have liked! That's ok, we'll just back track a bit and play catch up! 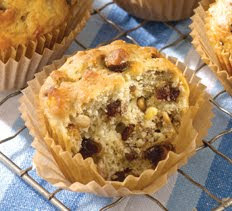 These muffins were in the back of the August/September issue of Cooking Pleasures, a magazine I receive for being a member of the Cooking Club of America. I'd had them marked forever because I knew I'd make them. *If your trail mix does not have chocolate in it, you can substitute 1/2 cup chocolate chips. I just used trail mix and left out chocolate, since neither of us are big fans, though. Heat oven to 350° and line pans with muffin cups, or non stick spray. Combine flour, sugar, baking powder, salt, and baking soda in a large bowl. Add in mashed bananas, melted butter, and beaten eggs. Mix at medium speed until well combined. Fold in trail mix. (The trail mix I used was a combination of many nuts and dried fruits. It made each bite really interesting and a suprise.) Spoon into baking dishes and bake per the instructions below. I made 24 mini muffins and 6 regular muffins with this mixture, with the mini ones baking slightly less time. We snacked on a few the morning of our trip in the car, and the rest Johnny ate for breakfast in the hotel room each morning. We have a few left a week later, stored in a zip bag and believe it or not, they're still moist! Unfortunately, with the hustle and bustle of leaving for the trip, I did not get any pictures of them! I thought I had, but I just uploaded my pics and don't see any. The ones left have been in a plastic bag for a week so they aren't pretty! The picture shown is from their website. Hope you get to relax now that you're back! Trips are fun but I always like settling back in. Great idea!! I rarely get to eat trail mixes because they always seem to have a nut I'm allergic to but I could definitely make my OWN trail mix to put in these muffs. Love the idea. Glad you are back! I was just thinking of making banana muffins today!